Sergei Udaltsov (C), Russia’s leftist anti-Kremlin group Left Front activist, gives a speech as he takes part in rally against pension reform in Moscow on July 18, 2018 ahead of a parliament vote. Russian lawmakers tentatively approved a hugely unpopular government plan to hike the state pension age that has led to protests and a record slump in Vladimir Putin’s approval ratings. In a rare move, usually pliant Kremlin-friendly nominal opposition parties — the Communists, the Liberal Democratic Party and A Just Russia — rejected the legislation to raise the pension age to 65 for men and 63 for women. A total of 328 lawmakers in the lower house or State Duma voted in favour of the bill in its first reading, with 104 against, according to results released by the State Duma. Just one lawmaker of the ruling United Russia party voted against the bill. The planned pension age hike — a first in nearly 90 years — has led to a rare outburst of public anger. A legacy of the USSR, Russia’s retirement age — set at 55 for women and 60 for men since Stalin — is currently among the lowest in the world. Given Russians’ low life expectancy, many will not live long enough under the new system to receive a state pension but the government says the burden is simply too much for its stretched finances. 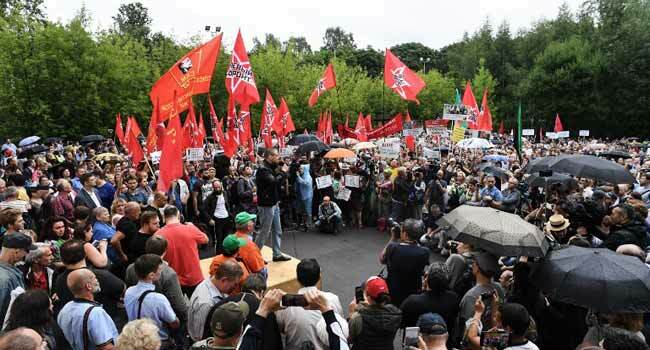 In early July several thousand people rallied in dozens of Russian cities in protests organised by Kremlin-friendly political parties and Putin’s top critic Alexei Navalny. On the eve of the vote around 1,000 people protested in Moscow and on Thursday around 200 people gathered outside the Duma itself. “We are living quite badly, people’s patience is running out,” said 54-year-old accountant Natalya, declining to give her last name. “We are sick of bearing this,” she added at Thursday’s protest ahead of the vote. Navalny called lawmakers “enemies of the people” for backing the legislation. “The Duma passed a bill according to which tens of millions of Russian citizens will be stripped of several hundred thousand rubles,” he tweeted. The government says the pension age increase is unavoidable as the current system represents a growing weight for the cash-strapped federal budget. On Wednesday, the liberal daily Vedomosti reported MPs were “advised” not to criticise Putin — who has sought to distance himself from the bill — during the debate. But some MPs from the Communist Party, which occasionally challenges the government on social issues but generally supports the Kremlin, demanded Putin take a public stance on the proposed legislation. “This is one of the most important laws in the last 14 years, it cannot be debated without such an important person in our political life,” Communist lawmaker Oleg Smolin said. A poll released by the independent Levada Center this month showed that the level of the Russian public’s trust in Putin had fallen below 50 per cent for the first time in five years, to 48 per cent last month from 60 per cent in January. According to the VTsIOM state pollster, the Kremlin leader’s approval ratings slumped by a record 14 percentage points in the space of nearly two weeks — to 64 per cent on June 24 from 78 per cent on June 14. According to the Levada pollster, 89 per cent of Russians oppose the reform and more than 2.8 million people have signed a petition against it. Russian life expectancy is low for a developed country, at about 65 years for men and 76 years for women. Unlike in Western democracies, pensions in Russia are meagre and many have to work past their state pension age to survive or rely on financial help from their children.